Many people believe that in order to do spellwork, you must be very dogmatic and structured and follow exact ceremonial “recipes”, but Magick is everywhere and just being aware of it and focusing its energies with intentions will the do the trick. In other words, when you are vacuuming your house, visualize the vacuum sucking up all the bad energy or any conflict that is happening in the home, sealing it up in the vacuum bag to be tossed out. When you are making dinner, as you pour in the ingredients, focus on them and visualize happiness, success, confidence or whatever you want for your family. Even as you light a candle, instill the flame with the will of what you are working on at that time. Holding intention is the key to directing your energy toward a goal. The key is to first examine the motivation and intention behind the goal. What do you really need? Why do you need it? Will it bring more joy, love, peace, healing to you and the world? This is the real end result of true magick. Everything is connected. When you direct your intention, you also direct the intention of the living world toward that goal. 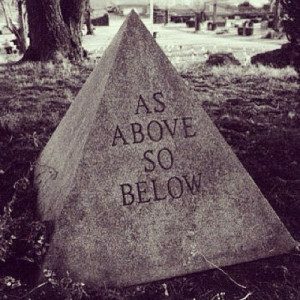 The ceremony, the words we may or may not recite, the way we dress or timing of the waxing moon are all just aids for our ability to focus on one thing for a period of time and to break down our mental barriers that tell us we are separate from the natural world, from the others, around us. Take a moment right now to stop reading, close your eyes, and breathe deeply. Listen to the sounds you hear and touch the ground beneath your feet. Imagine you can feel it humming with life. Expanding and contracting beneath your fingers as it breathes. Let your breath match it’s rhythm. Then take a deep inhalation and draw it’s living energy into your lungs. As you exhale, send that out into the world toward a positive life-affirming intention. Great job! You just did magic. The more you master your mind, it’s trappings and intentions. The more you bring it into a steady, focused state, the more in tune your magic becomes with your daily life. I so agree with this! Focused intention is what makes magick, not a particular set of words or exact ceremony. The more inner work I do the more connected to energy I feel and the longer I can hold intention.